“Just wanted to send over a note letting you know that yesterday afternoon YSL launched a blog to help celebrate the release of their new Opium fragrance. The message was sent by one Daniel Krantz, from Great Works, which a quick search revealed to be a buzz agency originating from Sweden, with offices in four countries. Knowing full well I’d never get any reply from my new friend Daniel, but somehow deeply annoyed, I asked him if that meant that the “old” Opium would be ditched after the bottle and its contents had already been thoroughly eviscerated by new YSL Beauté licence owners L’Oréal -- IFRA restrictions on eugenols may explain the hatchet job in part, but I suspect the grand dame also underwent a thorough nip-and-tuck in a bid to please the young’uns – or whether this would be a new flanker. The answer falls somewhere in between: Belle d’Opium is to Opium what Parisienne was to Paris, a “daughter” capitalizing on the family reputation. In other words, a Paris Hilton of fragrances. What interests me, vaguely, are the tactics deployed to launch the scent, which bring to mind those recently used to launch Thierry Mugler Womanity, in that they are a deliberate attempt to replicate the impact of the original Opium just as Womanity recycled Angel’s recipe for success. Like Womanity, Belle d’Opium – the name subliminally playing on Catherine Deneuve’s Yves Saint Laurent-clad character in the Buñuel movie Belle de Jour, though the moniker now refers to a famous call girl/blogger/author -- attempts to whip together an online community through its blog: “Visit daily as we reveal what inspired us. Tell us what inspires you” (doubtless so that the L’Oréal marketing team can knock together their next brief). Of course, no launch today would be complete without displaying the perfumer who composed the scent, in this case Firmenich’s Honorine Blanc who authored, among other things, Amor Amor Tentation, Marc Jacobs Splash Pear, Ralph Lauren Polo Explorer, Estée Lauder Amber Ylang Ylang, Sarah Jessica Parker SJP NYC and Cacharel Scarlett as well as celebrity juices for Paris Hilton, Gwen Stefani and Jennifer Lopez, none of which I’m familiar with, so that I can’t judge her style. Let’s say it’s probably not cutting-edge. Putting forward the attractive Ms. Blanc to add a drop of authenticity to the process is also somewhat dishonest: Belle d’Opium is certainly the result of design-by-committee. We’ll be seeing a lot more of these “straw noses” coming from big houses: the perfumer-as-star is the latest in marketing tactics. The “ingredients” are also displayed. “In the second video, mesmerizing time lapse blooms of the jasmine, gardenia and Casablanca lily flowers used in the juice open before readers' eyes”, gushes Grace Gold of Stylelist, the first site that appears in a Google search for “new Opium”. Never mind that gardenia and Casablanca lily can’t be “used in the juice” since, as perfume lovers well know, they can’t yield absolutes: they can be shown to give an idea of the notes, why not. As for Pierre Dinand’s groundbreaking design, overseen by Yves Saint Laurent, it had already been cannibalized by Fabien Baron and transformed into a cheaper-to-produce glass bottle to house the reformulation and, like the juice, it is a ghost of its former self. But the real fun starts when the Belle d’Opium blog takes us “behind the scenes” of a launch party which purportedly was “months in the making”. Again, an attempt to replicate the huge splash created by the original Opium launch party in New York in 1978, one of the major social events of the disco era – complete with the rental of a Chinese junk transformed into a floating garden with bamboo, cascades of orchids and lilies, a giant gold-leaf covered Buddha and beautiful people from around the world teeming around the undisputed king of couture, the rockstar-glamorous Yves Saint Laurent. The scope and impact of the launch of the original Opium actually raised the bar for every major launch that came after it: the consistency of the bottle, name and story, the shock value of a scent called Opium (the juice itself, directly inspired by Estée Lauder’s Youth Dew, was less than groundbreaking), the Yves Saint Laurent legend, the fact that perhaps for the first time in history, a couture collection was produced to back up the launch (the “Chinese” collection was presented one month after the launch of Opium was announced), the buzz created by the slow international roll-out (Opium came out in the States a full year after its launch in France because license owners Squibb balked at the idea of backing such a scandalously named product) … It marked a turning point in the industry. Any couture-labeled perfume from then on would represent such a major investment that the whole show was taken over by marketing. That’s pretty much when mainstream perfumery stopped being offer-driven. Belle d’Opium wants to create a similar stir by inviting us, via its blog and Facebook page, to a star-studded shindig shot by one Cobrasnake, reputedly the world’s most celebrated party photographer. French actor Mélanie Thierry succeeds Jerry Hall as the face for the launch. Alexa Chung, Alexandra Richards, Maggie Gyllenhaal, Jeremy Scott and Ashley Olsen now stand in for Diana Vreeland, Loulou de la Falaise, Calvin Klein, Halston, Nan Kempner and Truman Capote. The one person who was missing, the only one that could bring off the magic of Opium, has now been dead two years, after nearly a decade in limbo. I hope Yves Saint Laurent comes back to haunt the sleep of the L’Oréal people with huge puffs of the original clove-laden, non-IFRAed Opium. May they break out in hives. For a review of Belle d'Opium, click here. Image: Yves Saint Laurent and Nan Kempner at the launch party for Opium, New York, 1978. They just had to desacrate (the symbol and juice of) Opium, didn't they? "I hope Yves Saint Laurent comes back to haunt the sleep of the L’Oréal people with huge puffs of the original clove-laden, non-IFRAed Opium. May they break out in hives." Oh, and I truly hope Ms. Blanc is the first and the last of "straw noses". Marla, I think the teens can probably be very savvy when it comes to telling corporate hype from real buzz, and this instrumentalisation of blogging and community just rings pretty false. Last time I looked there weren't too many comments. It was pretty much predictable that it was coming to that anyway. But straw noses we've already been seeing, and we'll be seeing a lot more of: that's the way labs have been working for ages, it's just that now they're pushing names to the forefront. Loreal has acquired YSL perfume business, reformulated Opium and released in new design with much pathos. Denyse, I found the whole marketing campaign a bit baffling. There seemed to be no cohesion to it, just a bunch of random directions, a "throw enough sh*t at the wall and maybe something will stick" kind of thing. The What Inspires You? part was particularly dull, with none of the answers coming off as particularly inspirational: my aunt, live music, my mother, etc. The commercial (at least, the visuals presented in the video of the launch party) is awful. Another "hire a pretty face and have her loll against walls and roll around on the floor" composition. I can't help but think that anyone with even the slightest pop-culture savvy will be bored to tears by the whole thing. Well at least Maggie Gyllenhaal has some style. But no, she's no Nan Kempner. nice popping of the marketing balloon. of course, they are counting on the masses who don't know their history -perfumed and otherwise - to lap up their story, no questions asked. and, sigh, so many will. to them this all new and exciting. if they are even paying attention. then again, how else are companies to make a big noise these days but online? these tools didn't exist back in 1978... if they did, would the launch of opium have been handled differently? would we have had live web cams and live tweeting from the big party? the very fact that we weren't allowed immediate access to it and only heard stories about it made it seem more exclusif. i agree, today's party guest list isn't quite what it used to be as far as glamour and style are concerned. where is bianca jagger when you need her?! i forgot to add - even though the mugler marketing machine is doing something similar for womanity, at least it is a distinctly different name and, i hope, scent. in that case, the internet buzz is kinda fun, because it is something new from a house that brought us angel. womanity could turn out to be a total stinker, but i am intrigued enough to try it. i think he was smart not to pin another scent on angel's wings. Scentomatic, that's pretty much it, but just so there's no confusion: the Opium that came out in 1977 has been reformulated, but Belle d'Opium is a different fragrance. Nathan, I also found the "what inspires you" responses uninteresting, but then, what did you expect? As for the commercial, it's just the same-old, same-old, isn't it? When Yves Saint Laurent art directed the original Opium print ad he *did* introduce, or at any rate express the perfume/drug connection, and it was new, and shocking. Now it's become a cliché. Carter, I don't want to come off like a grumpy old lady saying "they don't make'em like they used to". The media/fashion/celebrity environment is so different, couture is now only a spectacle designed to push handbags, sunglasses and fragrances... I don't follow the celebrity scene at all now. There's really too much of it. Minette, it's interesting to see how companies try to leverage the Web to do their buzz and, yes, it's inevitable that they would. But most of the time it comes off as contrived and artificial: I think it's hard for the corporate giants who are used to total control to really engage with the medium, even when they hire internet buzz agencies who are more savvy about it. Minette, it's true that in Mugler's case, the idea for the Womanity platform did spring from the type of customer relations the company had from the outset with Angel, so that there is a legitimacy in attempting to whip up a community. a bow and a kiss on each cheek to you ! Way to stick it to 'em (L'Oreal), D. It is a shame to see corporate interest shape what scents come out these days. It's as if the holy grail of scents is to mimic Bud Light -- everyman's beer; funny how it tastes like piss. I agree (mostly) with you on the difference between corporate hype and real buzz; I just think there are so few examples of real buzz that are executed well. They're a little sloppy with their terminology on the Facebook, page, repeatedly calling this a "relaunch" -- as in "Thank you to the AOL Style List for picking up the relaunch of YSL Belle D'Opium" line. Hmmmm. Nit-picking aside, the original launch of "Opium" reminds me of the debut of "Jaws" and "Star Wars," roughly around the same time, which ushered in the era of the market-driven, spectacular special-effects centered blockbuster. Film has never been the same. Fragrance-selling has never been the same since the original Opium launch. But there is something pathetic about all this. Or maybe everything has been done and it's all re-treads from here on out. Marketing uber alles. But then, that folderol isn't aimed at me, or probably anyone who reads this blog. The only time I go to a perfume's actual site is to find out how much it costs or where I can buy it. If I want actual information about the actual juice, I come here or go to one of the other blogs I trust. So I've decided not to be offended by L'Oreal's condescending marketing,because it's obviously not aimed at me. Hell, they don't even know I exist. Good point StyleSpy. It's worth considering to whom (poor souls!) L'Oreal caters/markets. But by the looks of it, the buzz has flopped hard. What's worse, the marketing or that people bite? I'm curious (although this may open a whole new can of worms....) - how does the media's love of the "young and entitled", particularly in regards to new launches, effect your fragrance and perfume classes? Do you find the students entering the workshops are more educated because of the hype (and the celebrity attachment to product) or are they less prepared to actually think on their own (and form their own opinions) without some big company's PR telling them how cool they would be if the were wearing the same scent (fashion, haircut, music, etc) that Maggie Gyllenhaal, Jeremy Scott and Ashley Olsen wear? In some ways, I'm thrilled that perfume is getting press, but I wonder at what expense? Does everything have to be "dumbed-down" to the lowest common denominator? Marcus, I guess real buzz can only come from something that's good, and when people feel that they've discovered by themselves, even if they've been nudged towards it. Real buzz is me with Nuit de Tubéreuse! Corporate can't do it. Olfacta, your analogy is well chosen. As for the terminology, you get the feeling the whole Web aspect was outsourced to a company with no perfume culture and no desire to inform themselves. Hence that "the new Opium" email I got. Amy, the thing is, Google Belle d'Opium and in France, I'm at the very top of the page. People looking for info stumble on the blogs. Not all the blogs are written by clueless bloggers who just reprise the press release. Our views are out there, and even the most basic customer will happen on them now and then. Some fall through the rabbit hole! Marcus, it's just the start. Surely the buzz will direct more people to their site... But for the time being you have to put your ear to the ground to hear that lone mosquito. Marko, you raise an interesting point. I have two types of groups: the latest one was open to the general public so that the attendees were more sophisticated about fragrance. My student group is of course less savvy (mostly they are 20 year old American girls) but because I focus on classics and niche fragrances, they've said I've changed their view of fragrance as being mainly a celebrity/hype driven business. The ones who rejected it based on that judgment have reconsidered. And perhaps the ones who didn't pipe up, the Vera Wang wearers, now have another opinion of the whole thing. P.S. Bear in my that these are fashion students, not the average college students. This facebook belle d'opium launch leaves me completely indifferent. 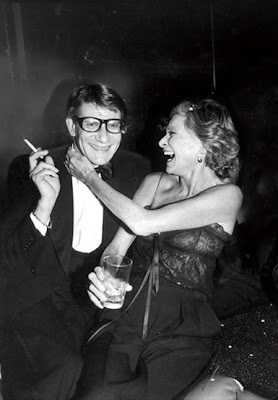 There is no way they could top the original launch of Opium with Monsieur Saint Laurent, and their feeble networking attemps are rather lamentable. Tara, and such a deserving scent it was for the buzz... I think the Vamp à NY operation is going to be pretty efficient too. Call me the tuberose-pusher. As for the Belle d'O campaign, I think it would deserve to fall flat on its face, although once more, that's not pre-judging the scent. If it's good, it's good and I'll say so. Denyse, thank you for the blow-by-blow analysis of this marketing campaign. I have not tried the "new" Opium yet, and I shudder to think what it smells like now. Of all the icons to ruin, why this one? Big mistake for them I think. I am willing to bet that Belle d' Opium will smell perfectly unrecognizable as an Opium-inspired fragrance. "Real buzz is me with Nuit de Tubéreuse! Corporate can't do it." -- Amen to that! Don't know who that "amen" is from, but I stand by it: real buzz comes from contact between the person who made the thing, and the people who truly, sincerely appreciate it, with a smidge of gradual disclosure... which comes, in turn, from being a trustworthy relay, someone who can be relied on not to spill the beans prematurely simply because it would spoil the fun for everyone else. That kind of trust builds up over time: it is fundamentally non-commercial, born of mutual respect. It most definitely cannot be bought. A standing ovation for you, D. You never fail us! Thank you. Terrific article. Donna, kind of a sitting duck, though, isn't it? D, that came from me (Marcus). A thoughtful response that I can't agree with more.